Explore concepts such as electrostatics, electric circuits, conductors, capacitors, dielectrics, magnetic fields, and electromagnetism. Learn to apply differential and integral calculus in order to solve problems associated with these concepts. Build your understanding and critical thinking skills through inquiry-based, laboratory investigations that explore these physics concepts. Interested in Taking AP Physics C: Electricity and Magnetism? Does our school offer AP Physics C: Electricity and Magnetism? What are the enrollment requirements for this course? What is the AP enrollment period at our school? Once you have all the information, enroll at school! 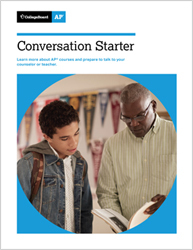 Use this conversation starter to talk to your teachers and counselors. Visit our AP Physics C: Electricity and Magnetism page.